Sexual reproduction takes place with slight variations in different groups of plants. Plants have two distinct stages in their lifecycle: the gametophyte stage and the sporophyte stage. The haploid gametophyte produces the male and female gametes by mitosis in distinct multicellular structures. Fusion of the male and females gametes forms the diploid zygote, which develops into the sporophyte. After reaching maturity, the diploid sporophyte produces spores by meiosis, which in turn divide by mitosis to produce the haploid gametophyte. The new gametophyte produces gametes, and the cycle continues. This is the alternation of generations, and is typical of plant reproduction ((Figure)). A typical flower has four main parts—or whorls—known as the calyx, corolla, androecium, and gynoecium ((Figure)). The outermost whorl of the flower has green, leafy structures known as sepals. The sepals, collectively called the calyx, help to protect the unopened bud. The second whorl is comprised of petals—usually, brightly colored—collectively called the corolla. 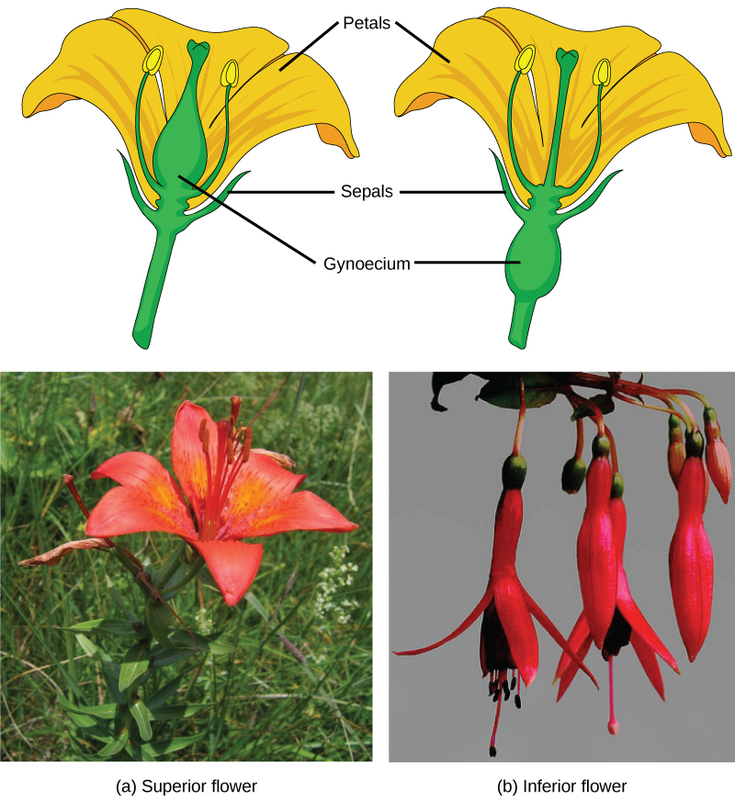 The number of sepals and petals varies depending on whether the plant is a monocot or dicot. In monocots, petals usually number three or multiples of three; in dicots, the number of petals is four or five, or multiples of four and five. Together, the calyx and corolla are known as the perianth. The third whorl contains the male reproductive structures and is known as the androecium. The androecium has stamens with anthers that contain the microsporangia. The innermost group of structures in the flower is the gynoecium, or the female reproductive component(s). The carpel is the individual unit of the gynoecium and has a stigma, style, and ovary. A flower may have one or multiple carpels. If all four whorls (the calyx, corolla, androecium, and gynoecium) are present, the flower is described as complete. If any of the four parts is missing, the flower is known as incomplete. Flowers that contain both an androecium and a gynoecium are called perfect, androgynous or hermaphrodites. There are two types of incomplete flowers: staminate flowers contain only an androecium, and carpellate flowers have only a gynoecium ((Figure)). The corn plant has both staminate (male) and carpellate (female) flowers. 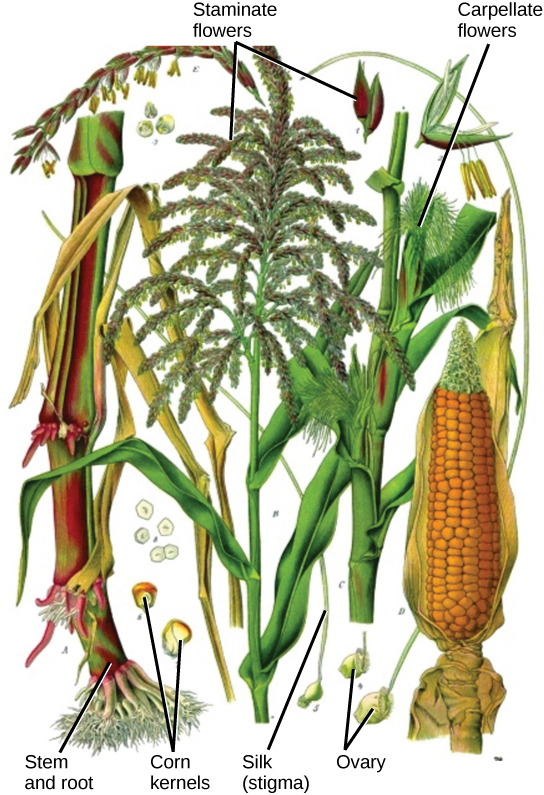 Staminate flowers, which are clustered in the tassel at the tip of the stem, produce pollen grains. Carpellate flowers are clustered in the immature ears. Each strand of silk is a stigma. The corn kernels are seeds that develop on the ear after fertilization. Also shown is the lower stem and root. If both male and female flowers are borne on the same plant, the species is called monoecious (meaning “one home”): examples are corn and pea. Species with male and female flowers borne on separate plants are termed dioecious, or “two homes,” examples of which are C. papaya and Cannabis. The ovary, which may contain one or multiple ovules, may be placed above other flower parts, which is referred to as superior; or, it may be placed below the other flower parts, referred to as inferior ((Figure)). The male gametophyte develops and reaches maturity in an immature anther. In a plant’s male reproductive organs, development of pollen takes place in a structure known as the microsporangium ((Figure)). The microsporangia, which are usually bilobed, are pollen sacs in which the microspores develop into pollen grains. These are found in the anther, which is at the end of the stamen—the long filament that supports the anther. Within the microsporangium, the microspore mother cell divides by meiosis to give rise to four microspores, each of which will ultimately form a pollen grain ((Figure)). An inner layer of cells, known as the tapetum, provides nutrition to the developing microspores and contributes key components to the pollen wall. Mature pollen grains contain two cells: a generative cell and a pollen tube cell. The generative cell is contained within the larger pollen tube cell. 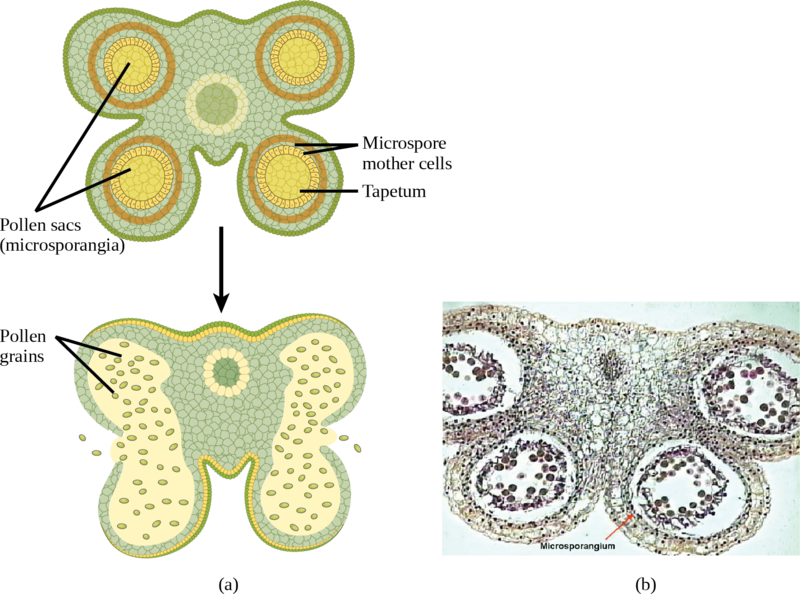 Upon germination, the tube cell forms the pollen tube through which the generative cell migrates to enter the ovary. During its transit inside the pollen tube, the generative cell divides to form two male gametes (sperm cells). Upon maturity, the microsporangia burst, releasing the pollen grains from the anther. 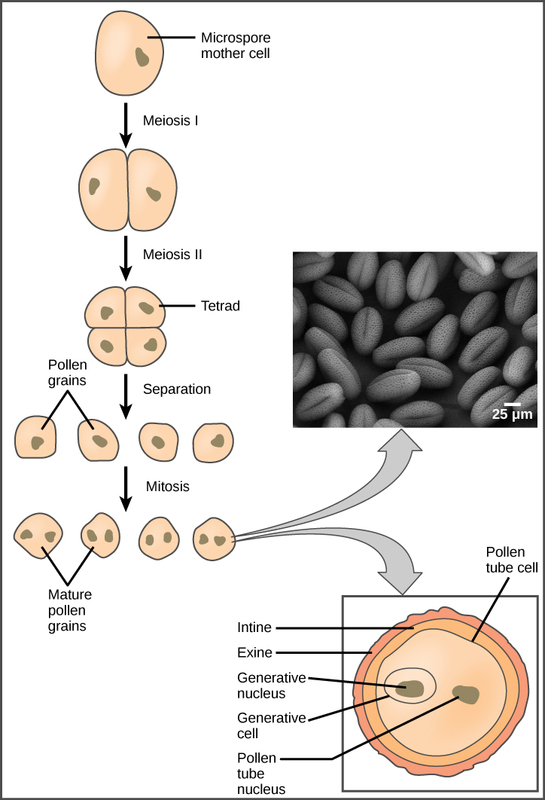 Each pollen grain has two coverings: the exine (thicker, outer layer) and the intine ((Figure)). The exine contains sporopollenin, a complex waterproofing substance supplied by the tapetal cells. Sporopollenin allows the pollen to survive under unfavorable conditions and to be carried by wind, water, or biological agents without undergoing damage. 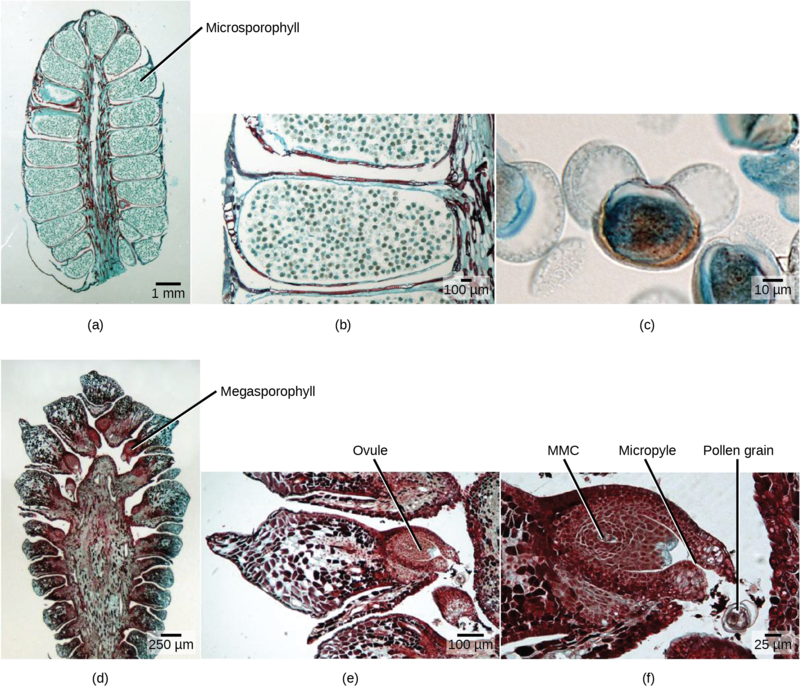 While the details may vary between species, the overall development of the female gametophyte has two distinct phases. First, in the process of megasporogenesis, a single cell in the diploid megasporangium—an area of tissue in the ovules—undergoes meiosis to produce four megaspores, only one of which survives. During the second phase, megagametogenesis, the surviving haploid megaspore undergoes mitosis to produce an eight-nucleate, seven-cell female gametophyte, also known as the megagametophyte or embryo sac. Two of the nuclei—the polar nuclei—move to the equator and fuse, forming a single, diploid central cell. This central cell later fuses with a sperm to form the triploid endosperm. Three nuclei position themselves on the end of the embryo sac opposite the micropyle and develop into the antipodal cells, which later degenerate. 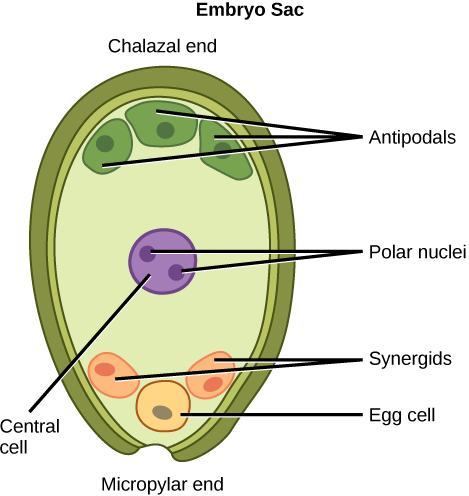 The nucleus closest to the micropyle becomes the female gamete, or egg cell, and the two adjacent nuclei develop into synergid cells ((Figure)). The synergids help guide the pollen tube for successful fertilization, after which they disintegrate. Once fertilization is complete, the resulting diploid zygote develops into the embryo, and the fertilized ovule forms the other tissues of the seed. As with angiosperms, the lifecycle of a gymnosperm is also characterized by alternation of generations. In conifers such as pines, the green leafy part of the plant is the sporophyte, and the cones contain the male and female gametophytes ((Figure)). The female cones are larger than the male cones and are positioned towards the top of the tree; the small, male cones are located in the lower region of the tree. Because the pollen is shed and blown by the wind, this arrangement makes it difficult for a gymnosperm to self-pollinate. A male cone has a central axis on which bracts, a type of modified leaf, are attached. The bracts are known as microsporophylls ((Figure)) and are the sites where microspores will develop. The microspores develop inside the microsporangium. Within the microsporangium, cells known as microsporocytes divide by meiosis to produce four haploid microspores. Further mitosis of the microspore produces two nuclei: the generative nucleus, and the tube nucleus. 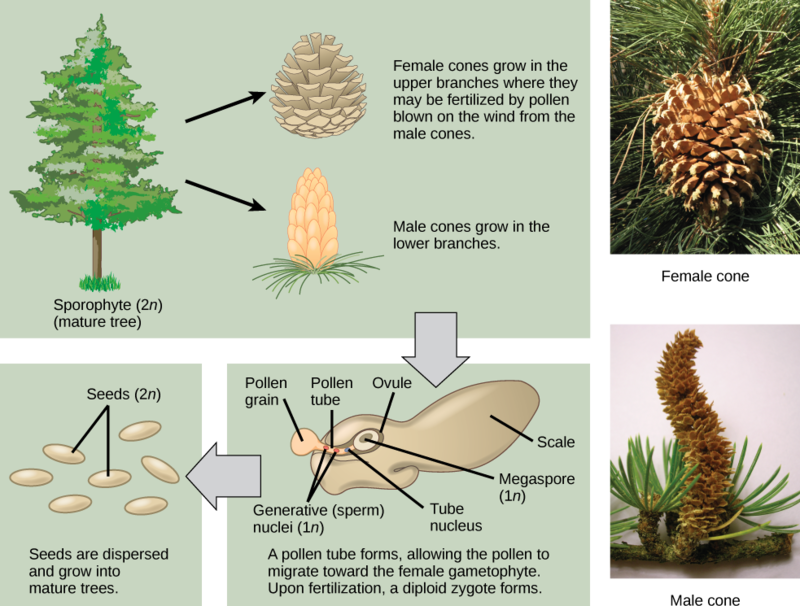 Upon maturity, the male gametophyte (pollen) is released from the male cones and is carried by the wind to land on the female cone. The female cone also has a central axis on which bracts known as megasporophylls ((Figure)) are present. In the female cone, megaspore mother cells are present in the megasporangium. The megaspore mother cell divides by meiosis to produce four haploid megaspores. One of the megaspores divides to form the multicellular female gametophyte, while the others divide to form the rest of the structure. The female gametophyte is contained within a structure called the archegonium. 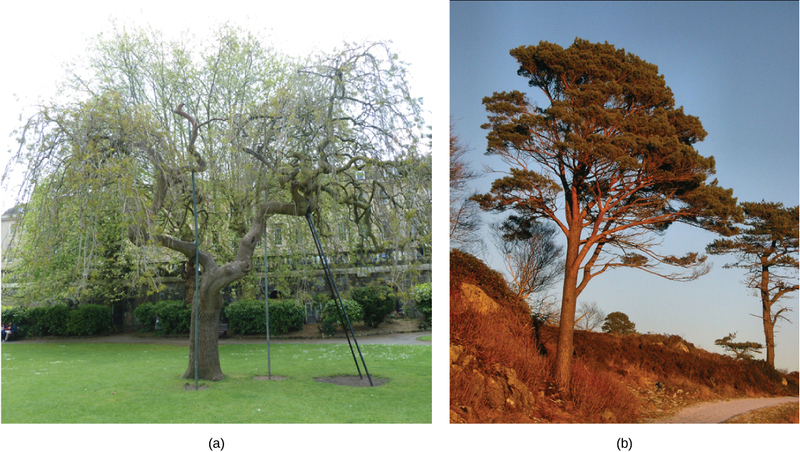 Gymnosperm reproduction differs from that of angiosperms in several ways ((Figure)). 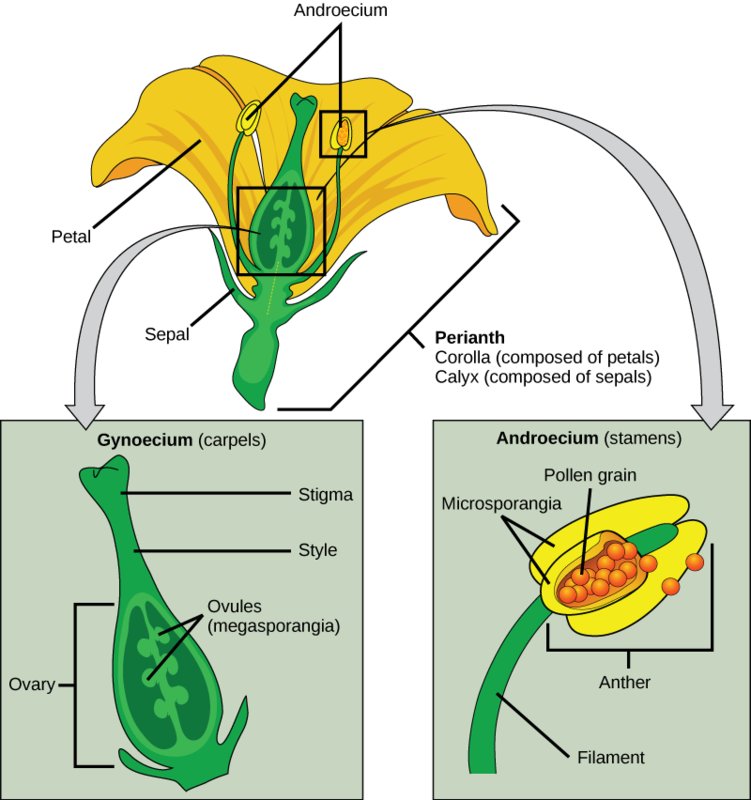 In angiosperms, the female gametophyte exists in an enclosed structure—the ovule—which is within the ovary; in gymnosperms, the female gametophyte is present on exposed bracts of the female cone. Double fertilization is a key event in the lifecycle of angiosperms, but is completely absent in gymnosperms. The male and female gametophyte structures are present on separate male and female cones in gymnosperms, whereas in angiosperms, they are a part of the flower. Lastly, wind plays an important role in pollination in gymnosperms because pollen is blown by the wind to land on the female cones. Although many angiosperms are also wind-pollinated, animal pollination is more common. (Figure) If the anther is missing, what type of reproductive structure will the flower be unable to produce? What term is used to describe a flower that is normally lacking the androecium? What term describes a flower lacking a gynoecium? (Figure) Pollen (or sperm); carpellate; staminate. (Figure) An embryo sac is missing the synergids. What specific impact would you expect this to have on fertilization? (Figure) B: The pollen tube will form but will not be guided toward the egg. Reproductive Development and Structure by OpenStax Biology 2nd Edition is licensed under a Creative Commons Attribution 4.0 International License, except where otherwise noted.